For many Christmas is the most expensive holiday of the year. Parties, presents, entertaining…it’s easy to see how the spending adds up and blows the budget. 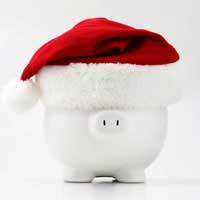 This article will look at some ways to save money over the Christmas holidays and how to have a festive time on a sensible budget. The key to enjoying Christmas, without going into debt for the rest of the year for it, is to plan carefully and shop shrewdly. One of the main expenses during the Christmas holidays is presents, especially for those who have a large family and/or children. Nobody wants to hear it but super-organised types save lots of money every year by stocking up on Christmas presents during the January sales. If that is just too depressing an idea for you, try getting creative with Christmas presents. Home-made presents often mean a lot more to the recipient as well as being easier on your budget. Use a talent you have, for example knit scarves or decorations, or bake cookies or jam and present them in pretty containers. Make gift baskets from special offer toiletries or a cheap DVD from a car boot sale, packaged up with popcorn and wine. Use your imagination. If you have loads of presents to buy, keep a running list throughout the year and buy gifts as you go, rather than trying to buy everything with November’s wage. If you have a specific gift in mind, use online price comparison sites to make sure you get the best deal. Consider whether people actually want more clutter. A gift of time might be a more thoughtful and well-received offering. For example, cinema tickets for two or a ‘voucher’ promising a slap-up meal cooked by you. If you’re having a party, you don’t have to feel obliged to provide everything! Most guests would bring a bottle anyway, but it's likely they would not begrudge bringing an item of food as well. Get organised by telling people which specific thing to bring and you’ll soon have a delicious and varied buffet which has only cost a small amount to each guest. Make mulled wine! It’s festive and can be spun out with cheap wine and juice. Look out throughout the year for offers on food and drinks that will not spoil. Christmas parties need decorations but they don’t have to cost a lot of money. Store decorations from year-to-year carefully and they will last ages. Additionally you can often find beautiful old decorations in charity shops and jumble sales. Don’t buy extra dishes, table cloths and napkins etc... just for one Christmas party. Save money and stay within your budget by borrowing from friends and neighbours. Make sure you keep a note of who lent what!